Cheese and Macaroni casserole is my favorite casserole of all time. This recipe is from my grandmother, and as a child I always looked forward to this delicious casserole being served. Don’t miss out on this delicious casserole. The name really doesn’t do the casserole justice. It is wonderful! This recipe is by Ethel Eynard. Jefferson City, Mo. 1967. Hands down my favorite casserole, this recipe was from my Grandmother. Brown ground beef, drain and set aside. Brown bacon, and add onion. Drain. 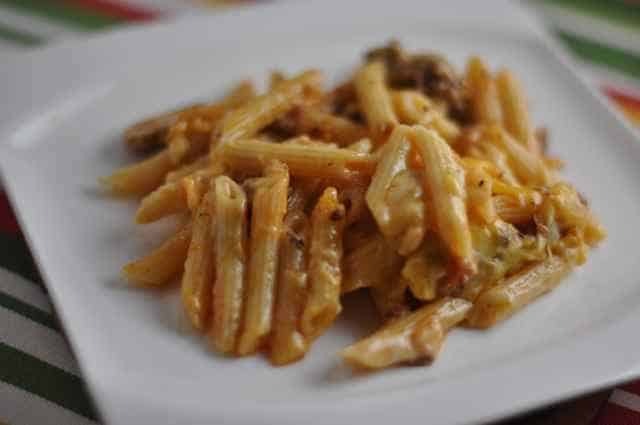 Mix in beef, sauce, seasoning, mushrooms and cooked macaroni. Simmer 15 minutes, stirring frequently. Pour 1/2 of the mixture in a large greased casserole dish. Cover with 1/2 of the cheeses. Add remaining macaroni mixture and add the rest of the cheese. Bake for 20 to 25 minutes at 375 degrees.